Do you own goldfish? Check your tank. See any green stuff growing on the sides? That’s algae. Algae are marine-based photosynthesizing organisms (in other words, they live in water and make energy from sunlight). Although they make energy from sunlight just like land-based plants, because they don’t have many of the features that land-based plants have (e.g. leaves, roots, etc.) they’re considered to be a different group. Algae are one of the most abundant organisms around. Simple algae are one-celled organisms; seaweeds are just algae that decided to go into business together. The chlorophyll and other plant pigments are known as phytochemicals, or plant chemicals. We know that these plant chemicals have benefits for humans, although we don’t know all the chemicals or exactly how they work. Eicosapentaenoic acid (EPA) and docosahexaenoic acid (DHA) are often cited as being the beneficial components of fish oil, yet they actually originate in algae (mainly DHA). Algae are the base of the food chain for fish. Fish consume these algae and then concentrate high amounts of EPA and DHA in their tissues. Algae can absorb and contain marine minerals such as iodine, magnesium, potassium, calcium, and magnesium. Consuming iodine from dietary sources such as seaweed is essential for the maintenance of good health, particularly for thyroid health. Most algae supplements are produced under controlled laboratory conditions. Humans developed on diets consisting of marine life, wild game and/or inland plants. This type of diet provided sufficient omega-3 fats, which resulted in an omega-6/omega-3 ratio that was around 1:1. The current North American diet provides a ratio that is around 16 to 20:1 (omega-6:omega-3). This is likely due to the shift in dietary staples, which generally do not include foods like flax, hemp, walnuts, perilla, green leafy veggies, chia, fish and algae. How do algae supplements compare to fish supplements? Algae supplements appear to be similar to fish supplements. Data indicate that supplementing between 1 and 2 grams of algae oil per day significantly elevates blood levels of DHA and EPA. This dose may also help to lower blood triglycerides, raise HDL, control inflammation, and lower blood pressure and heart rate. While the estimated extent of DHA retroconversion to EPA has been reported at 1% to 25%, the average is around 12%. 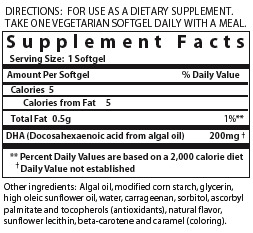 Many algae supplements have a lower recommended dose than fish oil supplements. Why not just eat ALA? Flax is a dense source of alpha-linolenic acid (ALA), another omega-3 fat. Data show that flax tends to increase blood levels of ALA, but not necessarily EPA and DHA. While ALA can be converted into EPA, the conversion rate varies and tends to be low. So, while flax can slightly help to improve fatty acid balance, it won’t do much good if one’s overall diet is poor. Why not just use fish oil supplements? A study from 2006 found that if current overfishing and pollution patterns continue, we can expect to see a complete collapse of world fish populations by 2048. It takes about 2 pounds of wild fish to produce 1 pound of farmed fish. Octo-mom doesn’t think that’s sustainable. Will we run out by 2050? The UN has reported that 2/3 of the world’s fish are either depleted or fully exploited. Some of this might be due to the recent 3000% sales increase in fish oil. If everyone decided to eat more fish and/or take fish oil, we wouldn’t have enough fish. 90% of small fish caught in the world’s oceans each year, such as anchovies, sardines, mackerel and menhaden, are processed to make fishmeal and fish oil. These species reproduce quicker than others, making them more resilient to fishing pressure. Factory-farmed fish, pigs, and poultry are consuming 28 million tons of fish each year as feed, roughly six times the amount of seafood eaten by Americans. Fish concentrate not only EPA and DHA from algae, but environmental contaminants like the pesticides DDT and Dieldrin and polychlorinated biphenyls (PCBs). Over the last 20 years the ocean’s mercury levels have risen about 30%. This means people around the world could be increasingly exposed to mercury from eating fish and other seafood. Although algae contain some contaminants, potential for concentrating high levels is limited. Studies show that unpurified fish oil supplements contain unsafe levels of environmental contaminants. Other data have revealed that 80% of fish oil supplement (61 of 75) companies verify that they have met the strictest U.S. standards for eliminating contaminants. Some people choose not to eat animals and attain omega-3’s from plant foods. Most of us benefit from omega-3 supplementation because our omega-6 intake is so high. We would be able to use fewer omega-3 supplements if we balanced our food better (see All About Bad Fats & All About Flax for more). The fish oil supplement recommendations that exist today are based on a high omega-6 intake. Most algae supplement manufacturers recommend between 200 and 300 mg/day. While that may be enough for those with a balanced fat intake from food, optimal health benefits may result from consuming between 1 and 2 grams (1000 and 2000 mg) of combined EPA/DHA per day from algae, split between two doses. Specific conditions may warrant more or less. About 6% of U.S. women, or about 3.8 million people, exceed the amount of mercury that the EPA says is safe for fetuses. The demand for omega-3 supplements would be much lower if we limited our intake of omega-6 fats. Omega-3 fats thin the blood – if you take a blood thinning medication, don’t supplement until checking with your doctor. Data indicate that pigs and poultry around the world consume more than twice as much seafood as the Japanese eat. Store your algae supplement in a dark, cool place. Keep out of light and high temperatures. Burdge GC & Calder PC. Conversion of alpha-linolenic acid to longer-chain polyunsaturated fatty acids in human adults. Reprod Nutr Dev 2005;45:581-597. Starling S. ALA-DHA conversion negligible, say fatty acids experts. March 2009. Beeby R. Our oceans overfished to feed the pigs. The Canberra Times. October 2008. Sunderland EM, et al. Mercury sources, distribution, and bioavailability in the North pacific Ocean: Insights from data and models. Global Biogeochem Cycles 2009;23. Arterburn LM, et al. Distribution, interconversion, and dose response of n-3 fatty acids in humans. Am J Clin Nutr 2006;83(6 suppl):1467S-1476S. Kelley DS, et al. DHA supplementation decreases serum C-reactive protein and other markers of inflammation in hypertriglyceridemic men. J Nutr 2009;139:495-501. Conquer JA & Holub BJ. Supplementation with an algae source of docosahexaenoic acid increases (n-3) fatty acid status and alters selected risk factors for heart disease in vegetarian subjects. J Nutr 1996;126:3032-3039. Doughman SD, et al. Omega-3 fatty acids for nutrition and medicine: considering microalgae oil as a vegetarian source of EPA and DHA. Curr Diabetes Rev 2007;3:198-203. Vidgren HM, et al. Incorporation of n-3 fatty acids into plasma lipid fractions, and erythrocyte membranes and platelets during dietary supplementation with fish, fish oil, and docosahexaenoic acid-rich oil among healthy young men. Lipids 1997;32:697-705. Ryan AS, et al. Clinical overview of algal-docosahexaenoic acid: effects on triglyceride levels and other cardiovascular risk factors. Am J Ther 2009;16:183-192. Arterburn LM, et al. Algal-oil capsules and cooked salmon: nutritionally equivalent sources of docosahexaenoic acid. J Am Diet Assoc 2008;108:1204-1209. Gerster H. Can adults adequately convert alpha-linolenic acid (18:3n-3) to eicosapentaenoic acid (20:5n-3) and docosahexaenoic acid (22:6n-3)? Burdge GC, et al. Effect of altered dietary n-3 fatty acid intake upon plasma lipid fatty acid composition, conversion of [13C]alpha-linolenic acid to longer-chain fatty acids and partitioning towards beta-oxidation in older men. Br J Nutr 2003;90:311-321. Kelley DS, et al. Docosahexaenoic acid supplementation decreases remnant-like particle-cholesterol and increases the (n-3) index in hypertriglyceridemic men. J Nutr 2008;138:30-35. Williams CM & Burdge G. Long-chain n-3 PUFA: plant v. marine sources. Proc Nutr Soc 2006;65:42-50.